The RICOH THETA Z1 is a major improvement over the THETA V, offering superior image quality and features such as RAW that are valuable for many industries, including real estate, tourism, training, construction, used car sales, and visual special effects (VFX). Higher resolution and more color and light information in each picture mean greater detail on the zoom and better shots in low light or shots with bright and dark sections. The Z1 takes images at 6720x3360, a major improvement over the 5376x2688 of the V.
You can see great use of THETA Z1 DNG images by Sam Rohn in this article. RICOH developed a plug-in for Adobe Lightroom Classic CC that makes it easy to stitch the RAW DNG images in a smooth workflow with Adobe Lightroom Classic CC. I tested the RICOH THETA Z1 in early morning low light conditions. Even with my below-average photography skills, I found that Z1 handles the light/dark balance better than the V. I also compared the resolution and found that in pictures of my garden, the Z1 offers much better details of the leaves. For a better example of images, see the article on Sam’s images. Setting the Z1 to take RAW images is easy with the mobile app. RICOH created a Lightroom Classic CC Plug-in to easily stitch the dual-fisheye RAW images into equirectangular. The DNG file is created alongside a standard JPG file. Please pay attention to the following screenshots for usage of the plug-in. 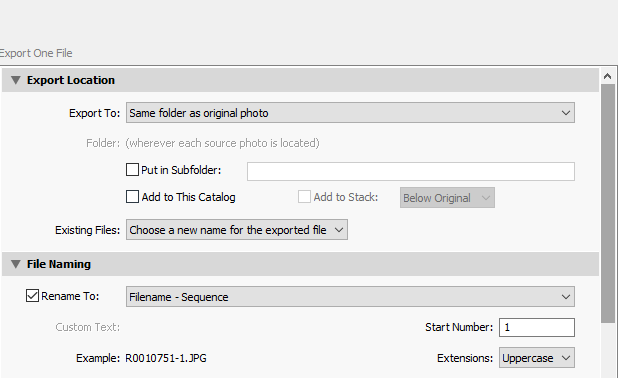 Note that you must keep the filename of the stitched file the same as the DNG file. 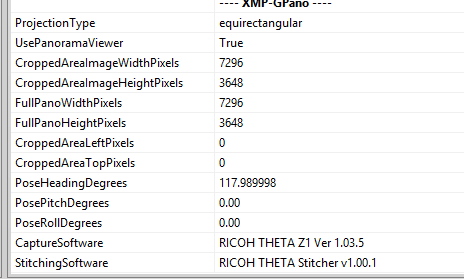 Select the Application “RICOH THETA Stitcher.exe” on your local computer, then save as a Preset. On my computer, this is the location of the RICOH THETA Stitcher. You have a wide range of editing tools. Within Lightroom Classic CC, the stitching app can automatically be called up at time of export. After you press “OK”, an image is saved to disk that can be used in 360 viewers. 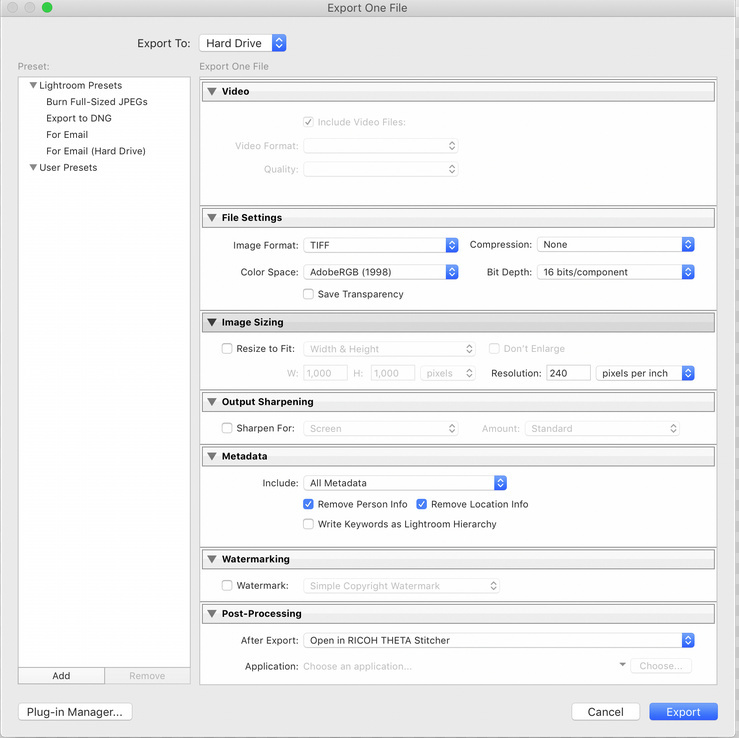 The metadata of the exported image is preserved. The test below was done with exiftoolgui. As the RAW image format has so much flexibility, I spent additional time comparing the RAW DNG file to the JPEG file. The DNG file is 46MB in size. This is a first quick look at the THETA Z1 images. Due to the improvements in image resolution, light, and color data, the Z1 images offer much great flexibility for color and light editing compared to the images from the THETA V. The stitching app for Adobe Lightroom Classic CC is a great addition that allows the DNG images to be used easily. The increased resolution will also help computer vision and object recognition projects. @Serendigity, thanks for your question. 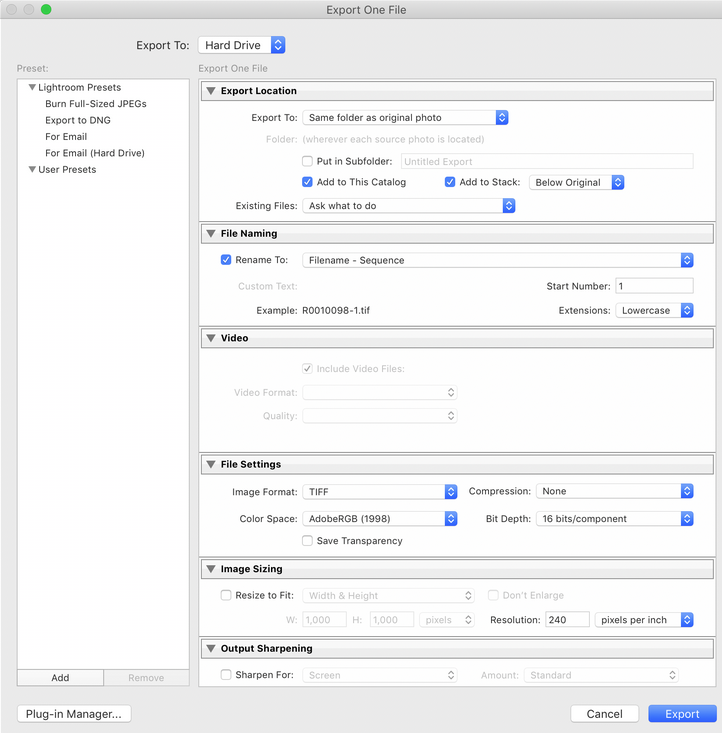 Unfortunately, we’re going to need to wait for more experienced photographers for help in providing a good workflow example. I can help with testing the functionality of the software and the process of configuration of the software. 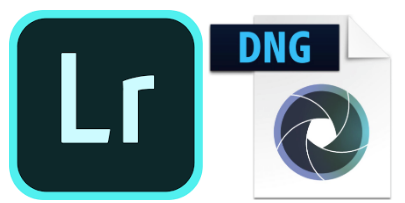 I need help from creative people on testing the DNG editing process. I believe that you can apply a range of Lightroom presets to the DNG file and then achieve a seamless stitch. As far as I can tell, this opens up a range of artistic and creative possibilities. Note that I added a workflow to use GIMP, darktable, and PTGui here. People can experiment with the techniques even if they don’t have Adboe Lightroom Classic CC. I would love to see some techniques and examples posted here. You are welcome to tinker with them. Re using PT Gui, I have downloaded the demo and I am having a play. Looks promising. @Serendigity Just even those different effects are pretty slick looking. 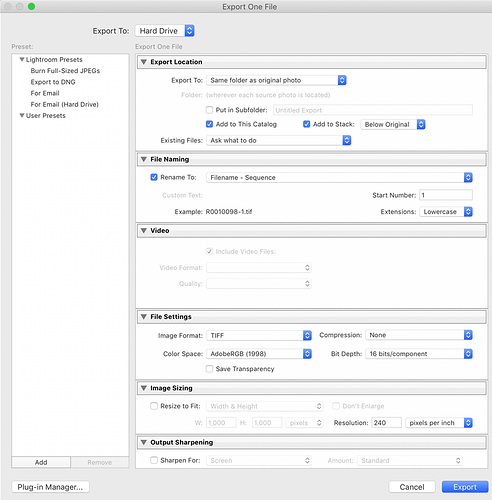 I would also like to start designing my workflow with Lightroom and the Ricoh Stitcher vs. the PTGUI Stitcher. However, I’m still waiting for my preordered Z1 for almost 2 months now and the delivery date is delayed again and again. Where can I find some DNG files and the Ricoh Stitcher for some initial testing?